Those words: back home, make me so happy. My mom called to tell me she had counted, and I had been to 10 different venues in almost as many days during my east coast tour. I was in denial about those numbers, but looking back on it, yup, she was right. Funny thing was, it never felt like work. Mostly because of the awesome people I met along the way. First thing I did after I landed in New York City was to go to the New York Restoration Project offices, where an awesome urban farmer and tree steward had invited me to visit. After I had a gander at the offices–gorgeous and seems like a fun place to be–we went to the Spotted Pig for dinner. There we met up with the Pig’s forager and ate some yummy British pub food. The next morning I got a tour of some Bronx gardens. I can’t believe how much unused space is there! As we wandered, we met community gardeners and gawked at what people had planted. One proud urban farmer showed us his prized collard green patch. I loved the little houses people build in the gardens. After the tour, I went to Dewitt-Clinton high school in the Bronx. This great organization, called Behind the Book, provides kids at this and other “inner city” high schools books and then invites authors to come talk to the kids. I was flattered to be included in this program. I loved meeting the kids, who were so excited, and appeared to have actually read my book! A few hours later, I found myself at the Horticulture Society of New York, giving a reading and presentation. The HSNY is so f-ing cool. They do job training for guys post-prison, they have an amazing plant gallery and of course, a wonderful library. Many sweet people came to hear me talk, and I felt very loved–especially by Owen from Just Food. The next day, I took care of some business during the day, then did a reading at Vox Pop in Flatbush. Such an adorable audience! My favorite folks were a freegan couple who ended up bartering with me for a copy of my book in exchange for a hand-made knife. I definitely got the better end of the deal: the knife is freaking amazing. And sharp. I then headed to New England for the next four days, doing readings in Providence, Boston, Portland, and Portsmouth. What can I say? I love Providence! There I met the most amazing group of people who run the Southside Community Land Trust and City Farm, right in downtown Providence. 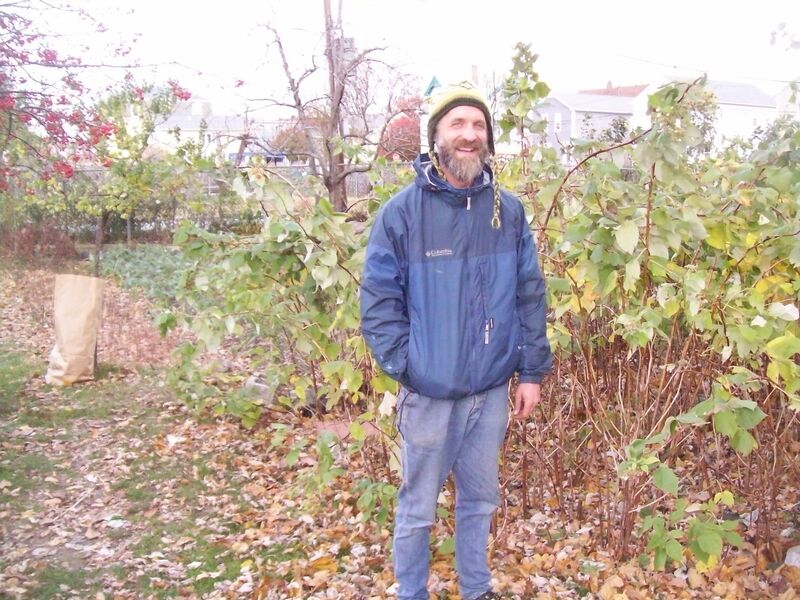 This photo is Rich Pederson, the main farmer at City Farm, standing next to his raspberry forest. He is a total rockstar, picked me up at the train station with raspberries to munch on. I got really inspired by his community building ideas: like block parties! rain water barrel building! vegetable start propagation and sales! We had a really warm, funny conversation in association with Providence Slow Food and the Unitarian church. I also got to meet and stay with Poor Girl Gourmet blogger, Amy McCoy. She is sooo fun. Boston was beautiful and freezing cold. Boston Slow Food really turned out people for my talk/reading, which was paired with a class on how to keep urban chickens. I also got the chance to see my dear old friend Joe Waldwell, painter extraordinaire. He played me a Quiet Riot song to get me geared up for my reading. Let’s just say, I was amped up! I have to go back to Boston because I missed seeing the famous Allandale Farm and the Food Project. Lucky for me, I think I’ll be hitting Boston again for the paperback book tour in June. That night, I took a bus to Portland Maine and found myself in a car that smelled like goat. Thank god. I love goat cars, there aren’t enough of them in this world. The driver, Margaret Hathway, is the author of The Year of the Goat, and she was wonderful. She and her husband Karl live outside of Portland, where they farm and make cheese, raise two adorable human children, and prepare delicious foods like beef stew and Pear custard tarts. Yum! In the morning, we went to Portland, had breakfast at Aurora Provisions (sage latkes AND beet sausage hash, good lord!). 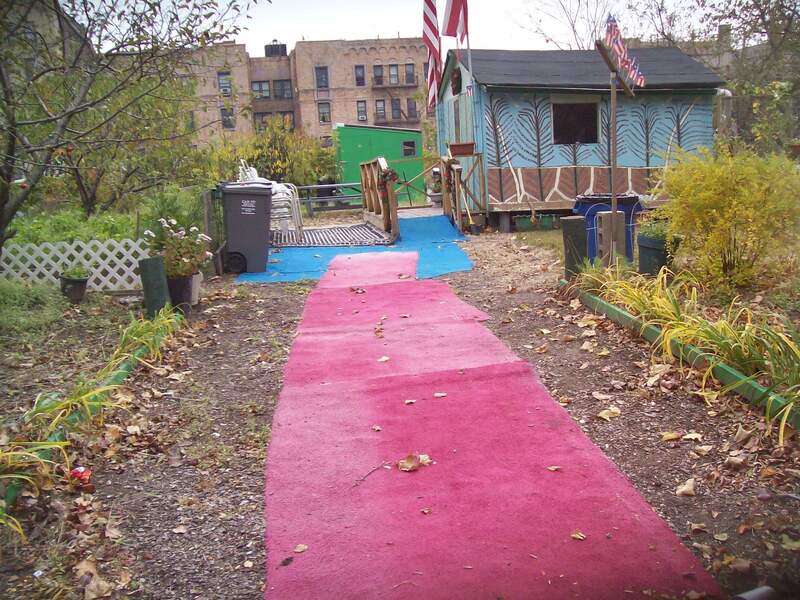 I always say this: every city I go to has an urban farm, you just have to ask. Portland, Maine was no exception.There’s a great org, Cultivating Community, who teaches local youth about farming, they have a little orchard, goats, and hella vegetables. I love their spirit. Stuffed and happy, I read at the fabulous Rabelais Books, the most amazing cookbook, food, farming, and antiquarian bookstore ever. It was the inspiration for the equally lovely Omnivore Books in San Francisco. Are you exhausted yet? Well, next I went to Portsmouth, NH for their 50-mile Thanksgiving Dinner where I did a little reading and talk about my farm. There was a “Nor’Easter” storm or something like that. Wonderful, slightly terrifying rain. I missed seeing the cool historic gardens there in Portsmouth, though. Next time? Back in NYC by 3am on Sunday. Just in time to rush to Brooklyn and teach my rabbit slaughter class. Hmmm. How I managed to make sense and gently guide my students to self-empowerment, I am not sure. But, the class was great, the students were eager, and the rabbits were healthy. Here’s one reporter’s take on the day. If I had seen the “bad” students, I would’ve clocked them. But like I said: tired. I spent the last few days in New York in an eating-fueled torpor: going to a mind-blowingly good dinner put on by a gaggle of chefs from the West Coast (Chez Panisse/OPEN) and the East Coast (Diner and Marlowe & Daughter/Sons) and Meatpaper Magazine. I cannot forget how delicious the Blue Point oysters of Long Island are. The cooks made dishes from rabbit, and I must say, it was outstanding. Highlights included the rabbit terrine, the Boudin Blanc, and the frisee salad. A dinner host on another night made the most delectable Long Island duck breasts, with macaroons for dessert. Stunning. Now I’m back at home, processing (obviously) everything I did in New York and New England. The goats are doing great: Bebe’s back in heat today, Hedwig’s coat is still luscious, Ginger is as dainty as ever. The chickens are all molting. The rabbits are getting big, and my new buck, Mr. Spider is becoming social and an adventurous eater. The garden is sprouting new seeds–beet, carrot, favas–and producing fruit–white genoa figs, Orange Cox apples, rhubarb, limes. The bees are enjoying the unseasonably warm days. And then there was Bill, who takes care of everything while I’m gone. What’s next? Working on a new book, curing olives, making cheese, planning some trips. But mostly enjoying the wonders of home. This entry was posted in field trips, travel and tagged farm city tour, new york city, portland, providence, rabelais books, slow food boston, slow food seacoast. Bookmark the permalink. I’m glad you were able to make it to Maine – inspite of the crappy weather ;). It was really nice being able to chat with you, and I am thorougly enjoying your book ;). When you get back to Boston, if you have a chance, you might look up Patty Moreno who goes by the moniker “Garden Girl.” She’s in Roxbury, which is a suburb of Boston, and while I haven’t seen her place in person, from her videos and website, it looks pretty awesome. I was two blocks from Vox Pop wanting to meet you, but I had a meeting with the Ditmas Park Community Board that night as well. Several of our farmyards are a couple blocks from Vox Pop and we have a CSA in that neighborhood as well. I have been waiting for the farmyards to slow down a bit to read your book, but apparently that never happens. I was hoping I could at least hear a portion straight from your mouth that night at Vox Pop but no luck. We are developing a 1-acre site in Crown Heights with goats and chickens which is keeping me busy . Loved the post, it felt as if I could see everything that was happening. You described everything so well. I loved the part where you talked about an organization, called Behind the Book. I have always wanted to do something on those lines: provide kids with high school books and invite authors to have a talk with the kids. It’s fantastic that you took up the opportunity to meet the kids. I also loved the part about you getting in the car that smelled like a goat:) That was funny! i totally missed you in new england — glad you’re doing another round in the spring, but i know how good it can feel to be home! sorry detroit didn’t work out, next time though, and glad you got to meet up with rich in providence, he visited me when he and his wife were here last thanks giving, and he is a great guy. 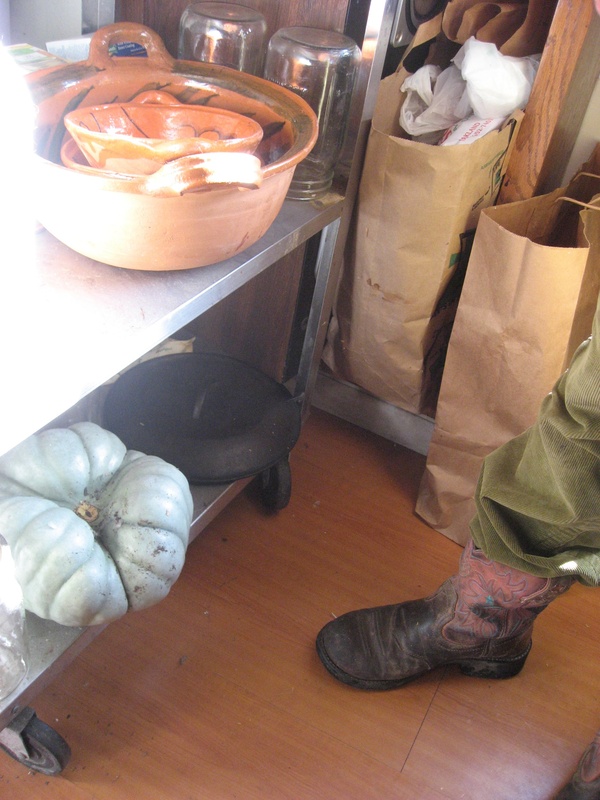 we have been writing back and forth for the last year comparing working in urban ag. been some talk of a urban farmer meet up or support group. I’m so glad to hear that everything went well on the rest of your tour – even with the 3am arrival in NYC and the Nor’easter (gack!). I can only imagine how happy you must be to be home with Bill, your flocks, bees, and garden. Like I said once or twice before, you have WAY more stamina than the average gal! Hey, if you have the time in June, let us know – Rich has plenty more rock star and rock star stories left in him, and we’d love to see you again! p.s. you’re pretty darned fun yourself. It’s probably good that we don’t live in the same neighborhood. Or coast, for that matter!